Good, mostly historical, inspirational read, though with very questionable theology. There is Catholic Father John Washington, a down-to-earth baseball champion and pianist. And there is Dutch Reformed Reverend Clark Poling, descendant of a long line of preachers, who was so active on his wedding day that he somehow gave his wife a black eye. By far the oldest, Methodist Reverend George Fox was wounded in World War I and left the military to become a pastor, only to rejoin as a chaplain during World War II. Rounding out the group is Jewish Rabbi Alexandar Goode, a young father and scholar. Deep in the midst of World War II, this unlikely foursome joins together on the ship Dorchester to travel through Nazi-infested waters. Having formed a bond through mutual love for God and people, they work together to keep up the spirits of their 900 shipmates, and in the end, to sacrifice their lives for them. The chaplains all believe in basic Biblical morality, so that is the pervading worldview. As a seventeen-year-old, Fox lied in order to be accepted into the army. Minor characters have committed various sins, which are not condoned. The four chaplains are Jewish, Methodist, Dutch Reformed, and Roman Catholic, respectively. The strongest theme in the book is their bond despite theological differences. Three of the chaplains have been active in cross-denominational ministry, and they seem to think of all the faiths being equally different from each other and equally the same. The chaplains pray, quote a small amount of Scripture, and have discussions among themselves and with unbelievers about everyone's need for God. Fifty years later, two characters sees the four chaplains walking along the beach and it is written as though the chaplains are actually there. As a child, one of the chaplains was shot in the eye with a BB gun. Fox worked as a medic during WWI and some of the horror of it is described. The fear of being torpedoed underlies the latter half of the book. Hundreds die from drowning or hypothermia, which is barely described. Cigarettes and cigars are smoked. A man tells that he had a child outside of wedlock, and how the community reacted. Husbands and wives have affectionate conversations with each other. There are two women on a ship with over nine hundred men, and the fact that they have to have special protection is mentioned a few times. It is stated that characters swear. True hero stories can never be told too often, and this book is about four true heroes. Called the "Immortal Chaplains" and awarded posthumously the Purple Heart, the Distinguished Service Cross, and the Chaplain's Medal of Honor, these four chaplains touched thousands by their sacrifice. 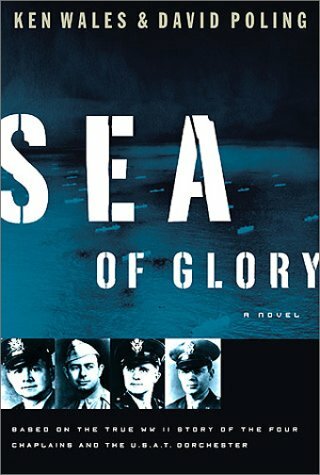 Sea of Glory is a collection of facts about these four men, with Wales' and Poling's interpretation adding life and intensity to the facts. It answers the questions: Who were these men? How did they become friends? What in their backgrounds allowed them to come together so heroically during the 20 minutes between the torpedo exploding and the Dorchester sinking? Where was the ship going and why? How did the story of the Four Chaplains survive the sinking? The chaplains are famous for coming together despite their different faiths. While I disagree with the chaplain's statement that it doesn't matter what people believe, their conversations, beliefs, and actions are very thought-provoking.